Adjust the light and control the view. Technology has changed a lot since the days of the good old venetian blinds. These days you can choose from fabric, wood, aluminium or synthetic materials and the styles are endless. You can have vertical or horizontal blades in fine, medium or wide blade… if they have blades at all! 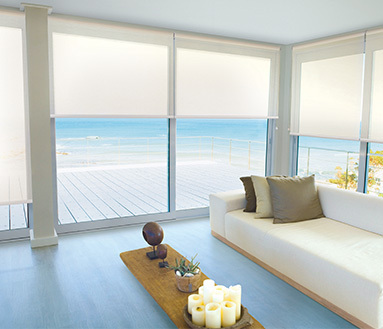 Roller blinds are available in full block out; light filtering and sunscreen mesh which filter the light but retain the view. We have the full range of Luxaflex blinds on display in our showroom, including the Architella blinds, the latest addition to their highly regarded Duette cellular range. These have a double layer of honeycomb for even greater energy efficiency. Stylish and easy to maintain, blinds offer a versatility that’s hard to beat. Paired with curtains they can also create a very dramatic look and provide optimum insulation at your window and doors. Click here for more information on Luxaflex products.